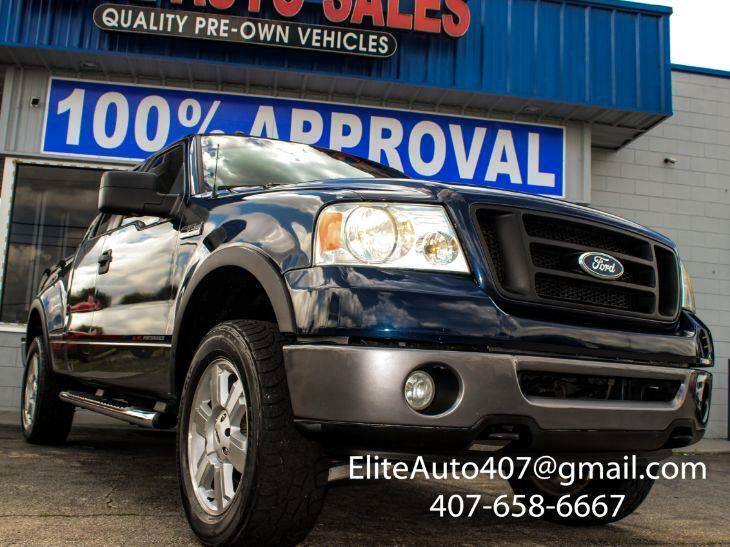 Feast your eyes on our 2006 Ford F-150 FX4 SuperCab 4X4 in True Blue Metallic. Powered by a robust 5.4 Liter V8 that delivers 300hp while paired with a durable Automatic transmission for towing ease. This Four Wheel Drive combination provides a confident ride and secures up to 18mpg on the highway. The eye-catching exterior features a sliding rear window, removable tailgate, great-looking alloy wheels, drop-in bed liner, and running boards. Enter the FX4 cabin to find comfortable seating and an interior thoughtfully designed for enjoyable travel. Take note of the multifunction steering wheel, full power accessories, and an impressive audio system with CD, USB port, and auxiliary input. There's a big, roomy back seat, so load up the whole gang and hit the road! Our Ford F-150 is packed with crucial safety features to give you peace of mind as you get to work. With ABS, airbags, and more, you can get behind the wheel knowing you're protected. Give us a call to schedule a test drive today!